I want to start by saying that I am against government interference in the contracting industry as much as anyone. It is certainly hard enough to profitably operate an HVAC service contracting business without another partner who is guaranteed their profit before the contractor owner has to pay all of the bills associated with each job to reveal if there even IS a profit. However, one of the places where local government and some dishonest people in the trades makes a mockery of the statutes and laws, is in the area of licensing and permits. The reason for licensing and permits is to protect the public against unsafe work being performed. There is also an element of consumer protection. Local government has registered and tested licensed professionals to protect against unsavory characters that are posing as legitimate service contractors. All of the honest contractors I know voluntarily follow the requirements to be licensed or registered if the community requires it. These same contractors comply with permits and inspection requirements as well. Even though it increases the cost of doing business and the prices the consumer pays for this service. With the economy the way it is, unlicensed and un-permitted work is at an all-time high. Many could argue that those who skirt the laws and codes are honest people just trying to make a buck for their family. My question is, what about the families of legitimate licensed contractors who follow the rules? Is their family less important? Without the added costs of licensing, permits, inspections, insurance, payroll taxes and other expenses needed to operate in the light of day, the prices of those who work in the dark shadows avoiding these laws charge less than half the amount of a legitimate contractor. Thankfully most homeowners in the long run, learn their lesson by receiving shoddy work that needs to be fixed or redone by a real contractor. However, real contractors should not have to wait to feed their families while these lessons are learned. I understand, this licensing and permit process is a great burden to the average contractor who complies with these laws in good faith. This raises the question: What can the licensed or registered service contractor do about the fringe side-jobber or dishonest contractor who works in the shadows and does not follow the process? You know, the people who willfully skirt the local ordinances requiring permits, inspections and in some cases licensing? The ones who seem to consistently forget to get a permit over and over again. Following this process protects consumers as well as increases the quality standards of the work that the HVAC, plumbing and electrical industry provides to consumers. When asked most contractors will say there is nothing you can do about it. I would like to offer some ideas to all of the honest contractors who follow the correct licensing and permit process. The people who have worked hard in some cases for generations to build their name and reputation on doing things BETTER than local government asks them to. You who have scratched and clawed in a day-to-day struggle to make ends meet only to have some hack avoid the local laws and ordinances that you follow each and every day and then lowball a price to do the work without permit or inspection. Remember that the squeaky wheel gets the grease. I have personally seen contractors I know make a difference in towns and villages who have sleepy or just downright dishonest inspectors, by getting serious about this issue. You may not think it is worth the time to take action. I know time is money but I want you to think of how much time you spend on estimates competing with these lowball losers who don’t follow the rules and then get the job anyway. On top of that think of how much time you spend complaining about how potential customers will learn their lesson by going with the unfair competitor. Do It Legal – Get a lawyer to write a letter on your behalf about the specific contractor and the specific address of home. Ask if you can purchase these in bulk. How much effort does it take to change the name and address of the complaint? One attorney said he would send out 10 letters for $175. Ask For Enforcement – State the law or ordinance that is being violated by the contractor and homeowner not being in compliance with licensing or permit laws. Remember YOU are paying taxes. Hold them accountable to give you what you are already paying for. Enforcement! State the Consequences – In the letter state the unfair business practice this presents, the loss of jobs and the potential danger to the community from these non-inspected jobs. Let them know that if a fire, flood or carbon monoxide incident occurs at this address that you will be front and center that you reported this activity months before it happened. Demand Action – Demand the contractor be fined, penalized and even banned from doing business for not following the permit/inspection process. 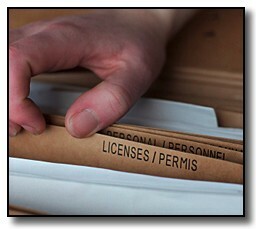 In some states and cities it is a crime to do business without a license or permit. If this is not the case write your councilman and start a movement to make such a law. Get Names – Walk into the building department and hand the letter personally to a supervisor or inspector. Most importantly GET THEIR NAME and write it down in front of that person. Tell them to update you with the progress as a public citizen as to what action has been taken. Provide all contact information so they can keep you in the loop. Tell them you will not forget to follow up with a superior if you don not hear back. Kick It Upstairs – Let the building department know that you are sending this letter to the mayor’s office and village or city board members. This makes all parties responsible and culpable should a horror story happen to a homeowner who purchases from an unlicensed contractor. Accountability – Advise all interested and influential branches of local government that legal action will be taken against the city if nothing is done about this issue. They will be held accountable as public servants and personally as a member of the community. Make a Deadline – Create a deadline as to when you expect to be updated about this situation. Follow through by escalating the report to higher ups in government and also the media. Use the Media – I know that politicians, inspectors and the media are not very popular with service contractors. However, use them to further the greater good. Local television stations absolutely LOVE to do stings on illegal contractor activity. Witness ACCA member Bobby Ring from Myer & Depew in New Jersey who was the consultant to NBC’s Dateline in a recent sting. Turn Over the Rock – Also send the letter to the offending contractor, (If you can find them) and let them know that they may be a party to the eventual lawsuit. Turn over all rocks and let the maggots squirm in the light of day. Let them know that trouble is coming and that everyone has been informed. Get permission from your lawyer to send this same letter to other cities and towns where you find license and permit violations. With the only change to the letter being the address of the home and the contractor or person in violation. You must keep doing this for each time you lose a job where no permit was pulled. Obviously this will rock the apple cart but you must stand firm on principle. Also attend local contractor meetings such as ACCA and PHCC and let your fellow honest contractors know about this process so they can do the same thing. You will probably never take legal action, but the threat of this is too big to ignore. Especially if multiple people in the local city or village know that each other knows about the situation but does nothing to stop it. Finally send a copy of this letter about this situation to the local media with a letter from you talking about how unlicensed contractors are a danger to our community. Ask them to run a story about this to create awareness. Tell them that you are available as an expert on this subject to be interviewed for the story. This is great PR for your company as well. I completely disagree with those who say we can do nothing about this. As you can see by the above, there is a lot you can do. Remember that if you want a fair playing field you sometimes have to fight for it! When it cost ‘Cheap Charlie’ contractors money, they will take the path of least resistance and start to follow the codes and laws to keep our families safe. I also completely disagree with those claiming that government is too lazy or that this is government interference in this situation. It is a matter of fairness and a service we are already paying for with our taxes. Shame on us as for not demanding that we get the enforcement of these laws that we have paid for with our hard earned taxes. Remember We the People ARE the government and as citizens, we are the boss of the building department and the mayor’s office. Hold them accountable and the laziness and uneven enforcement will stop. Joe Crisara, CEO of ContractorSelling.com is America’s Service Sales Coach. Joe has a style that has you feeling like he is a member of your family or someone you met before. His down-to-earth, direct and impassioned approach combines 31 years of contracting experience with strong expertise in sales best practices. 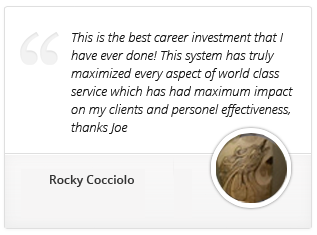 Thus, anticipate hearing the thunderous ring of truth from Joe, who stands apart from the traditional methods as he helps contractors achieve revenues 3-5 times greater than the average salesperson.